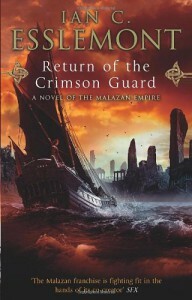 Return of the Crimson Guard ("RCG" from now on) is the second volume in Ian Esslemont's chronicle of the Malazan Empire (the first, Night of Knives, was an introductory novel taking place on the night Kellanved and Dancer ascended to High House Shadow and Laseen (aka Surly) became Empress). Behind that relatively short and unassuming sentence lies nine (of a projected 10) books by Steven Erikson as well as Esslemont's two, and a sprawling narrative that covers several continents, decades of characters, and entire geological ages. Readers will forgive me if I assume familiarity with the series (if memory occasionally fails, the Malazan pages on Wikipedia are often a good synopsis - not perfect but good enough). Definitely recommended to those already enspelled by Whiskeyjack, Anomander Rake, Trull Sengar, Karsa Orlong and all their compatriots. If you're not, you should begin with Erikson and get hooked before tackling Esslemont.